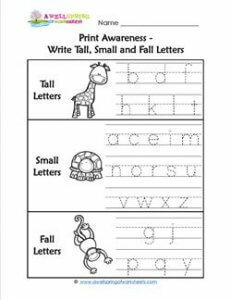 For your print awareness lessons use this tall, small, fall letters worksheet! Each set of letters is represented by an animal. Tall letters by a giraffe, small letters by a turtle, and fall letters by a monkey. Kids trace the letters in each set on the primary writing lines. Be sure and go over what makes a tall letter tall, a small letter small, and a fall letter fall. Have your kids say the letter names as they trace them. Kids will enjoy coloring the animals when they’re done with the tracing. Check out this page to see all the tall, small and fall resources on this site.